StonerDays new UV reactive socks for stoners are out of this world. We have just released a trilogy of UV Reactive socks and we all feel these are the greatest new thing. Everyone here received a pair and wore them to our weekly meeting where we used black lights. You all should have seen how excited we all were and our faces when we saw everyone below the knees glowing. These UV Reactive socks will have many people talking when walked into a room with! Our team has a bakers dozen more already lined up for the next drop. We encourage our fans to submit designs they would like to see come to life. We are a compiled bunch of artists and appreciated all inquiries. These socks brought out a vibe from everyone we know who has put them on. Be the first in your area to sport these dope new UV Reactive socks. 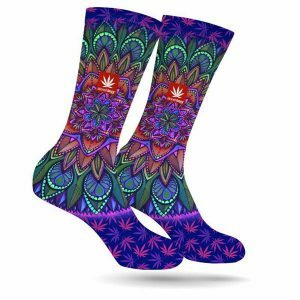 Whether you are in your favorite smoke room glazed with black lighting or at an amusement park surround by trippy lights you socks will show that you are on a whole other level. Stoners send us in a pic with your sporting a pair of our new UV Reactive Socks and we will ship out a double sticker pack for you and one of your homies. Stay Blazed with Stonerdays. This entry was posted in Featured, Product Reveiws, Stoner Clothing. Bookmark the permalink.